The Christmas season is in full swing in Lithuania. Christmas trees showed up last weekend in Klaipėda, Kaunas, Vilnius and other towns. This was the festive weekend for the international community with some of its traditional celebrations. On Saturday, the successful International Charity Christmas Bazaar took place in the old town hall and on Sunday, a real Dutch Sinterklaas (Sint Nic) arrived at the Dutch Ambassador's Residence in Vilnius. The Dutch Ambassador, Bert van der Lingen, welcomed Sinterklaas and Zwarte Piet (Peter) to his snow covered Residence whilst the waiting children provided a musical welcome. Most of the Dutch Sinterklaas repertoire celebrates the yearly joyful arrival of the good man. The children in Vilnius knew most of these tunes. This year there was also a bit of a Lithuanian touch with a traditional Lithuanian song. Sinterklaas is clearly related to Santa Claus in that he is a jolly looking, graceful ageing and bearded figure that distributes gifts to all well behaved children. On Sunday, Sinterklaas looked visibly pleased by the warm welcome. Meanwhile, Pieter carrying a bag filled with festive cookies and candies ensuring a sweet touch to the whole visit. An enchanting afternoon was definitely in store judging by the many happy children's faces. Most of the children are those of mixed Lithuanian-Dutch couples and children of several Dutch military personnel stationed in Lithuania. The Holy Man got quickly into action speaking to each of the children and listening to their stories. The good old man has plenty of knowledge of what they have been up to during the last year. Rewards are always in order and those were handed to Sinterklaas by his trusted helper Pieter. Sinterklaas also managed to provide some interesting interludes with inside knowledge of the parents to keep good listeners smiling. Sinterklaas had to leave after the festivities to ensure more happiness being spread around. Similar to all good mythical figures, he manages to be in many places at once. The celebration takes place on 5 December in most places in the Netherlands whilst in Catholic Belgium and elsewhere it is celebrated on 6 December. 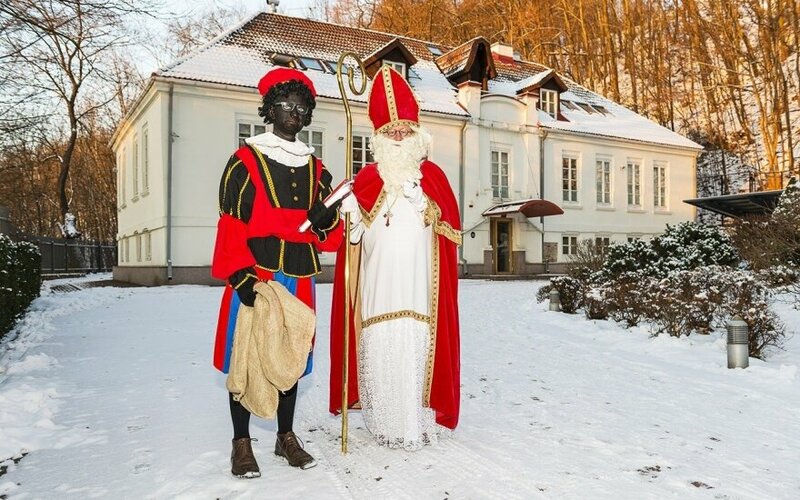 Events like this in Vilnius take sometimes place a few days earlier (Sinterklaas arrives weeks earlier in the country to take stock of the good behaviour and find appropriate gifts). It is a folkloric tradition with pagan elements that goes back many centuries and is a great way to keep nice traditions going.